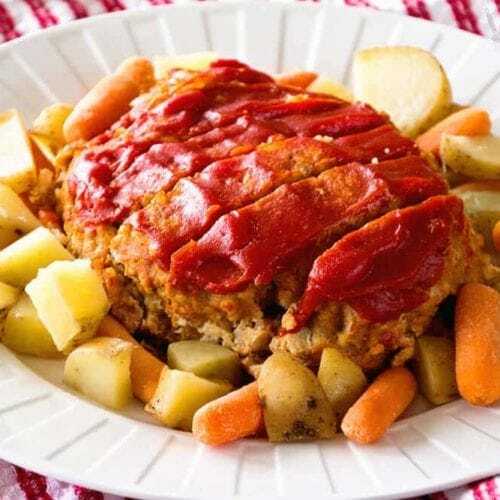 This Crock Pot Meatloaf is topped with Ketchup and made in the slow cooker with carrots and potatoes! 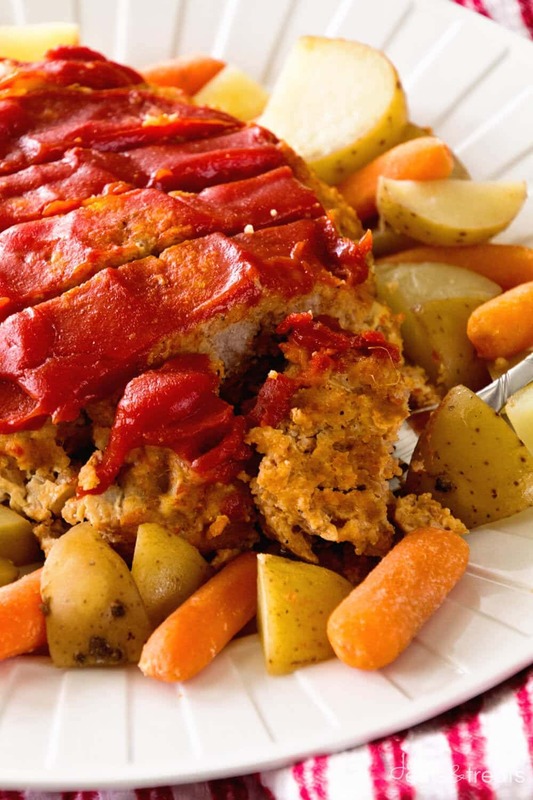 Throw this delicious Crockpot Meatloaf in your slow cooker this week! Anyone else love meatloaf, yet hate how long it takes to make? It’s kind of out the question for a quick weeknight meal in my book! 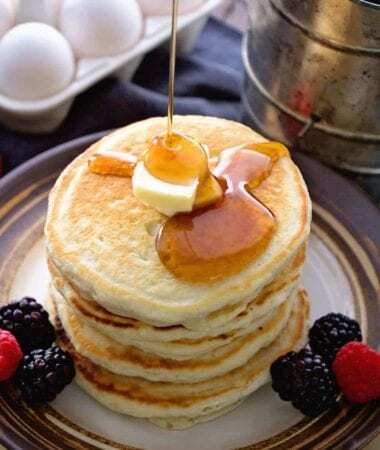 Some of our favorites include Chicken Bacon Ranch Meatloaf, Italian Cheese Stuffed Meatloaf, and Cheesy Meatloaf, but these happen on the weekend for sure. They do make a perfect Sunday Dinner that’s for sure! Ahhhh weekends they are good for a lot of things, not only meatloaf aren’t they? Our Saturday was a busy one that’s for sure! Harvest is in full swing out at my parents farm and this is the first time we went out to the farm to participate in the festivities. The day began with making lunch for the guys. I was not aware that I practically need a flow chart to make sandwiches for the guys. This one get bread, these like buns, this one doesn’t like anything but meat, but they get cheese and mayonnaise. After I was done making sandwiches I felt like my brain needed a break! My Mom sure spoils them. If it was me making them I’d be like here’s a bag of sandwiches. Eat Them. Nope. Not Mom. She gives them all individualized lunches with sandwiches (made to order), chips, grapes, cookies and a beverage of their liking. Guys, if you haven’t figured it out, you have it made! I was also reminded quickly how nothing goes as planned on the farm. You have to be able to roll with the punches and change your plans as you go that’s for sure. First, I was delivering lunch to the field. As I was walking out the door my phone rang, nope, beans are to wet so go meet the guys at the farm place. I get there and then they are working on a truck that broke down. That does not go as planned and takes up 2+ hours of the day. Whoops. Let’s just say they sent the wrong fuel filter, something broke off and I was supposed to run to the mechanic to get this fixed. I’m about ready to leave and suddenly I get a text to bring the part back because the mechanic is coming out the farm. Seriously. I can’t keep up! I also got to take a little ride in the combine with my little brother and Miss K. Apparently they named the tractor that Daddy drove last year and Miss K remembered it. If you are wondering it’s George, Curious George that is. Curious George also broke down. Well, actually the grain cart, which the hubs was driving. Therefore they had to go dig out the old grain cart and tractor and roll with that. Like I said, things are always changing! By the time I left I was exhausted just trying to keep up with it all and I hadn’t even did anything! Oh, by the way, want to know the name of the combine. In case you need a good laugh and all! Uncle Brent named the combine Cleetus and Miss K was DYING. Well, so was I for that matter! The day ended with us bringing a big meal of Crock Pot Italian Chicken out to the guys which they happily gobbled up! Nothing went wrong there thankfully! 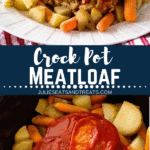 I know they would love this Crock Pot Meatloaf and Veggies just like we did! 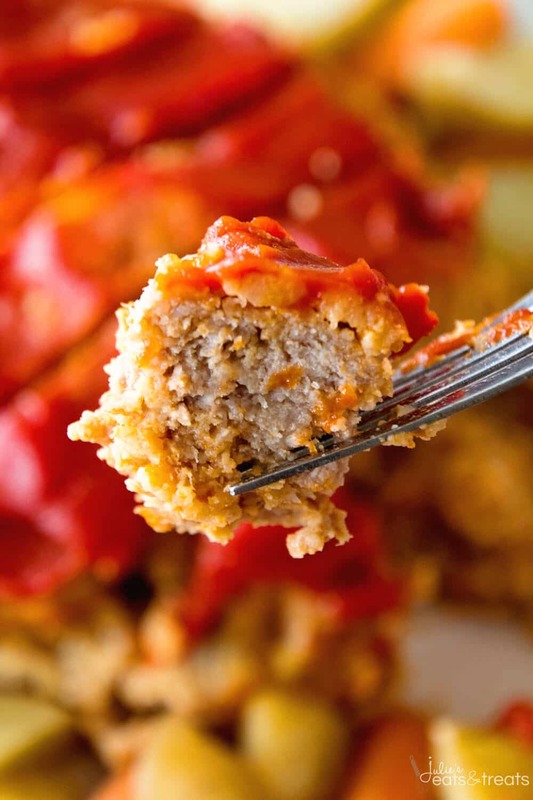 Can you cook meatloaf in a slow cooker? Absolutely! I don’t know why people don’t do this more often! Crockpot Meatloaf is so easy and makes an entire dinner with so little effort! How long does meatloaf take to cook in a crockpot? 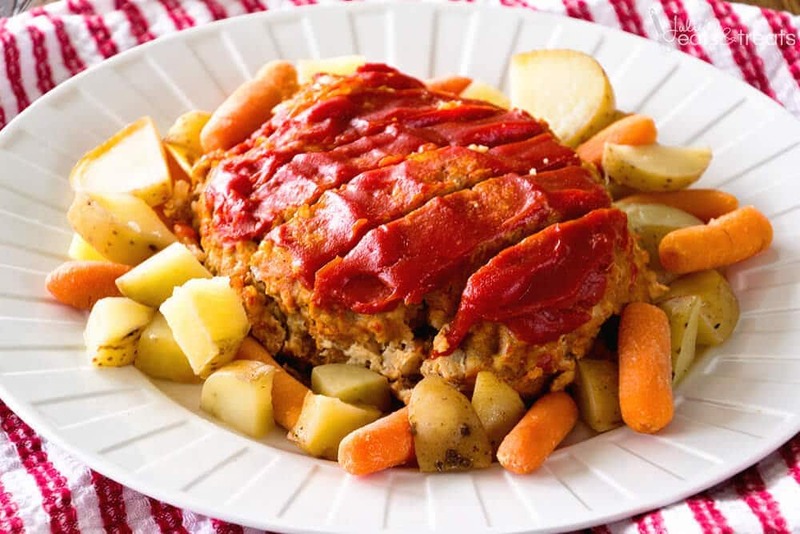 On high crock pot meatloaf will take about 4 hours – low 7-8 hours. Cook until the vegetables are tender and the internal temperature of the meat is 165 degrees. Slow Cooker Meatloaf cooks up so deliciously in the crockpot! I love that I come home and dinner is done! Slow Cooker Meatloaf is a complete meal in the crock pot which is awesome! 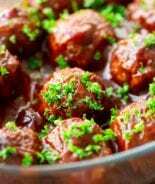 Can I substitute the ground turkey for ground beef? Yes, you can! It will be great either way, just pick which one you prefer. Plus, you guys, this crock pot meatloaf, it’s to die for! Perfectly moist and delicious! 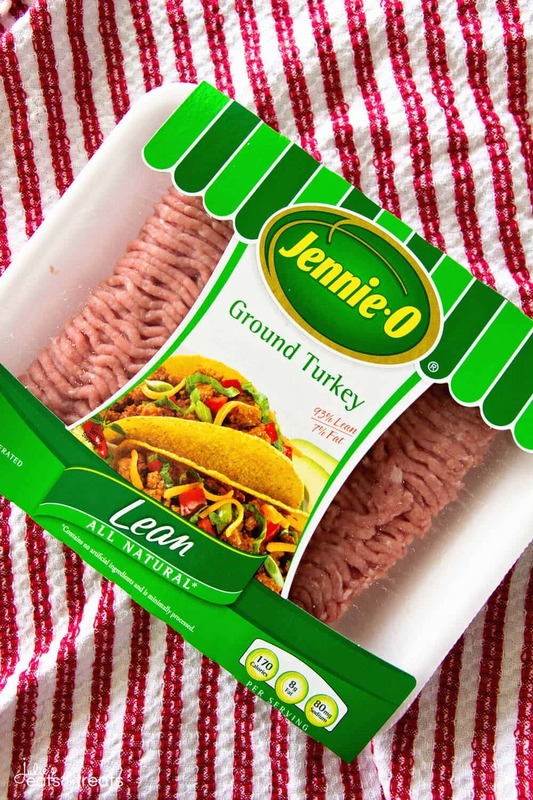 Grab your Jennie-O Ground Turkey this week and make a comforting meal perfect for busy nights, which I know we all have! Spray inside of the slow cooker with non-stick cooking spray. 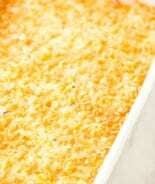 Mix together turkey, eggs, bread crumbs, ketchup, onion and seasoning. 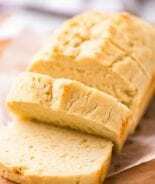 Form a loaf and place it inside the slow cooker. In a separate bowl mix together the carrots, potatoes, 1/2 tsp salt and olive oil. Place around the meatloaf in crock pot. Top meatloaf with ketchup if desired. Cook on until the veggies are cooked through and meatloaf’s internal temperature is 165 degrees. 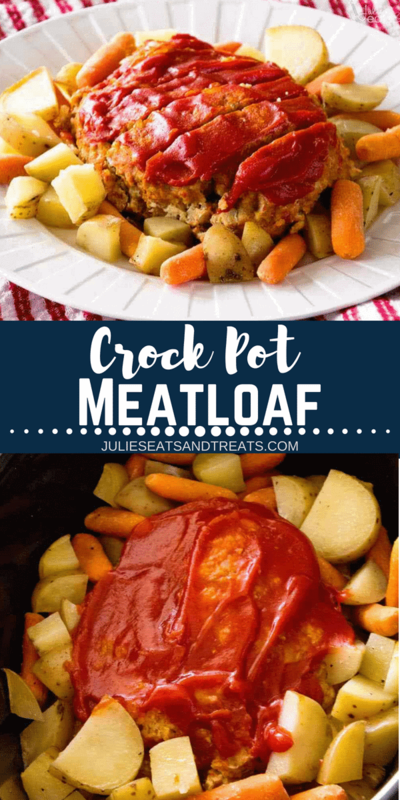 I hope you really love this recipe for Crockpot Meatloaf – I know we do! It’s easy to make and a complete meal – love that! 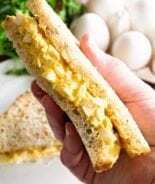 Be sure to comment below, I’d love to hear what you think of this recipe! If you make my recipe for Slow Cooker Meatloaf please tag me on Instagram @julieseatsandtreats or #julieseatsandtreats. That way I can see your delicious eats!!! Disclosure: Jennie-O has compensated me for my time to create this crockpot meatloaf recipe. 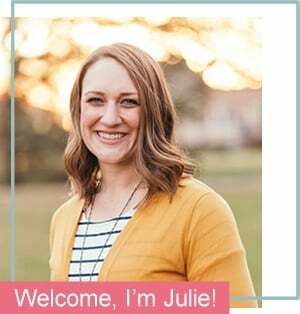 Thank you for supporting the brands that make Julie’s Eats & Treats possible. All thoughts are my own. 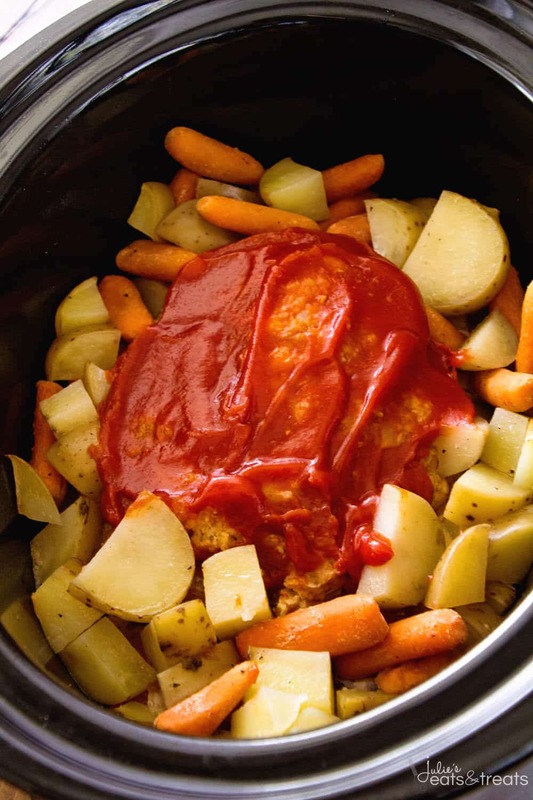 Comforting, Crockpot Meatloaf recipe Topped With Ketchup And Made In The Slow Cooker With Potatoes And Carrots! 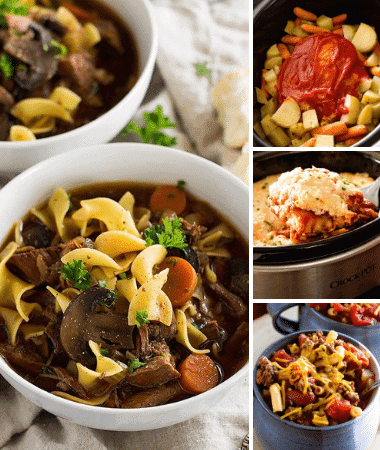 Make Your Entire Meal In The Crock Pot Tonight! In a large bowl mix together turkey, eggs, bread crumbs, ketchup, onion, 1 tsp salt and pepper. Form a loaf and place inside the slow cooker, making sure the meatloaf is not touching the sides. In a bowl mix together the carrots, potatoes, 1/2 tsp salt and olive oil. Place around the meatloaf in crock pot. Top meatloaf with ketchup if desired. Cook on high 4 hours or low 7-8 hours or until veggies are cooked through and meatloaf's internal temperature is 165 degrees. It’s so great to be able to cook everything together at once like this! Fabulous recipe! Yes it is! Such a lifesaver for busy nights! Does this end up with a natural sauce? 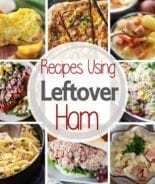 Has anyone tried the recipe? There’s liquid in the bottom if that’s what you are asking? Pounds… thank you for that! Would there be too much grease if done with 80% lean ground beef? I love that this uses ground turkey! Looks amazing! This looks like something my family would DEVOUR! I can’t wait to try it! This looks delicious and I love how easy it is! YUMMY! 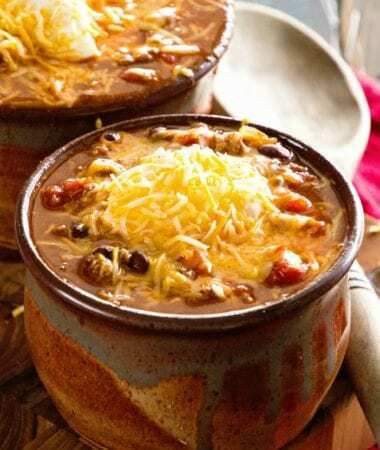 Can never go wrong with a traditional recipe like this!